The Spyro series has one of the best game soundtracks in my opinion. It's like Stewart Copeland has his own unique style of music that you wouldn't hear in any other game. 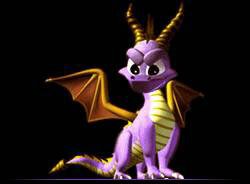 Actually, I do think the first Ratchet & Clank game had a similar style of music to the Spyro games. Upbeat and with a lot of experimental percussion, only there was more of a techno focus as oppose to guitar samples like in the Spyro games. Hmm they do sound similar now you mention it. Maybe Insomniac liked the Spyro music so much, they wanted to put something similar in Ratchet and Clank while giving more of a Sci-Fi feel as opposed to Spyro's fantasy atmosphere. I still remember the Peace Keepers theme. Now that was catchy! Is there no other similar Spyro-like music besides the first Ratchet and Clank game? There's something particularly special that sticks out by how the music is laid out. Post-Stewart Copeland, probably the Spyro GBA (Season of Ice, Season of Flame, Attack of the Rhynocs) game music is the closest to replicating it, especially under the GBA sound limitations; but I'm not sure what's exactly missing. Composed by Robert Baffy (Ice, Flame, Rhynocs) and Ed Cosico (Ice, Flame), maybe it's the usual caveat Spyro-sounding instruments? Perhaps the atmosphere? Some of the tunes are great (Dragonfly X Theme, Minty Mines, Celestial Plains, Rhynocs N' Clocks, and Chateau Ripto for examples), while some are just okay. I think this soundtrack is my definite favorite. I love some of the other games/levels (honestly I think EtD had an AWESOME soundtrack) but I think this one sounded the most..... idk, it just was v original sounding, and I love how each level sounded similar, and kept consistent styles and sounds and even tunes/melodies throughout each world! love the music for this game!